The Heart Bingo website is an extension of the popular Heart Radio and includes the same feel-good factor as the radio station itself. So if you like your music along with your bingo then this popular online bingo website is just for you. 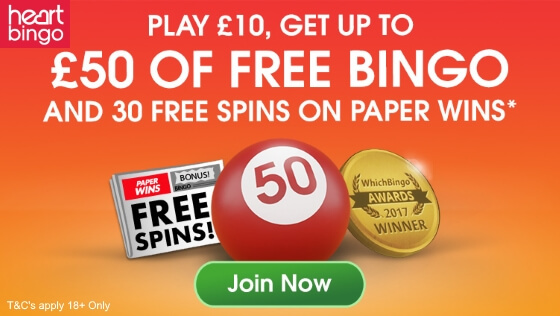 Sticking with the fun side of things if you join the site today you can get up to £50 in Free Bingo and 30 free spins on the Paper Wins online slot when you deposit and play just £10. To open a new account just simply follow any of the links within this article or click one of the two buttons (top or bottom of the page) and you will be taken to the Heart Bingo Login / Homepage. Then select the big ‘JOIN NOW’ button on their homepage to open up their registration form which you will need to complete in full. Once this is complete you can make your first deposit. The welcome bonus offer is a great way to start your bingo experience with Heart Bingo. The free bingo bonus is provided in the form of 200 free bingo tickets. Although they have no specific value you can use them to play online bingo games where the ticket value is up to 25p each. This is then the equivalent of £50 of free bingo. However, you do need to be aware that the offer is subject to terms and conditions with the key terms shown above. 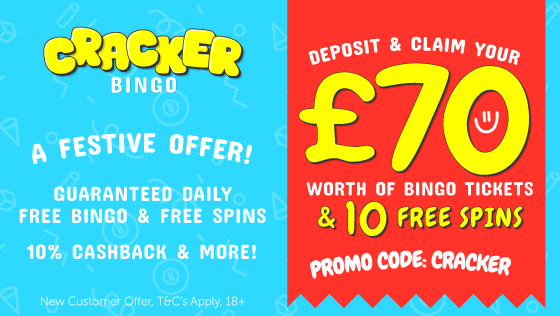 Once you have funded your account you can start enjoying the good variety of 90 ball and 75 ball bingo games on offer, along with the huge selection of online slots. They have unique games that you will only find on Gamesys powered sites. However, firm favourites such as Rainbow Riches, Double Bubble and Tiki Island are also available. The Heart Bingo website is mobile friendly so you can play wherever you are meaning you never have to miss out on the fun. Just visit the site from your mobile device, login and away you go. So CLICK the button below to deposit and play £10 at Heart Bingo today and receive your £50 Free Bingo Bonus and 30 Free Spins! 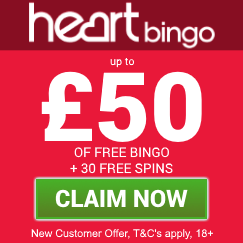 For full terms and conditions of this offer please visit the Heart Bingo website.